Do you remember watching Moulin Rouge, Australia and The (2013) Great Gatsby movies? Then you’re in for a serious treat as Baz Luhrmann’s Strictly Ballroom, the Musical is now playing in Sydney until early June. Enjoy the tango, shashay and bogo pogo that brings to life the original 1992 classic film in only the colourful and absolutely insanely mesmerizing way that Baz is famous for as a movie and musical director. For all you locals who always think ‘I’ll get around to it eventually,’ remember to cross this off your bucket wish list and go buy your tickets. For all you tourists heading into Sydney for a few days or week vacation, this is the time to truly see one of Australia’s most famous and talented directors in his best light. Warble along to amazing songs that replicate from the original movie, including Love is in the Air and new compositions by the multi platinum music composer, David Foster. Sequins galore, drama, humour and romance is the key to Baz’s new musical and it’s a show not to be missed. The prices range for weekday and weekend in the $85 - $110 AUD brackets and remember to budget for the sneaky Ticketmaster ‘inconvenience’ fees of around $8 AUD. 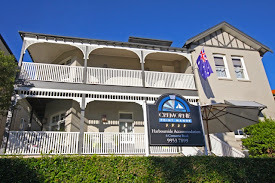 Travelling by car to the theater from a truly affordable Sydney hotel, Cremorne Point Manor, you’re looking at around a 13 minute drive and around 45 minutes by bus. The bonus? On the way back to the hotel, you’ll pass the famous Taronga Zoo so remember to send a late evening roar to the lions.